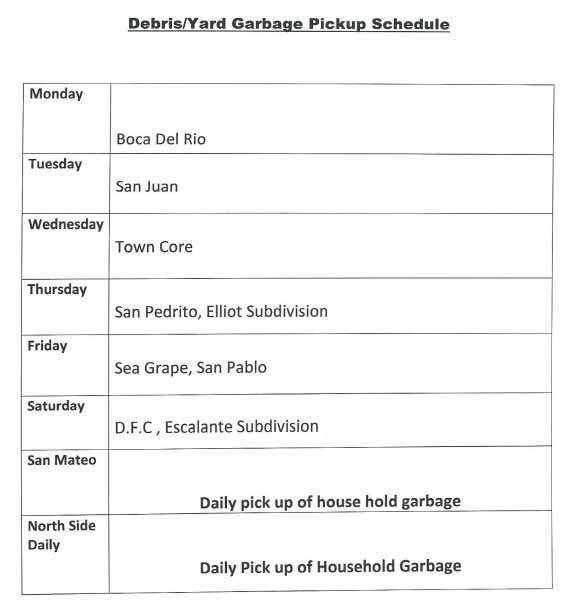 The San Pedro Town Council hereby announces it’s new and updated Garbage pick up schedule starting as of Monday, January 26th. We appreciate the patience of the general public, we do ask everyone to please separate you household garbage from the yard debris. It is of utmost importance that you bag your garbage hence making it easier for the workers to handle and it is a more effective way to get your garbage picked up in a timely manner. Good day everyone, Our garbage compactors were unable to come out in the morning for the daily pick-up of household waste due to mechanical problems; however, they will be collecting household waste in TOWN CORE up until this afternoon. To carry on quickly, we will be closing off sections of the street where the garbage compactor will be passing through. We kindly ask all drivers and pedestrians for their cooperation and understanding during this time. 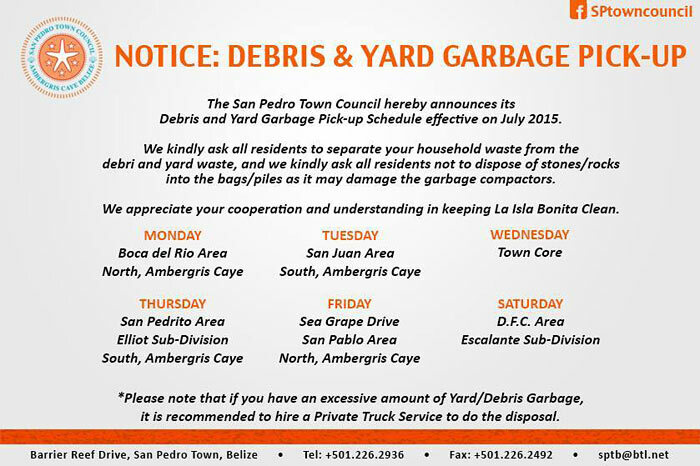 One of the biggest challenges the San Pedro Town Council faces is the collection and disposal of solid waste (garbage). Most garbage is comprised of daily household generated waste, but at times may include old mattresses, refrigerators, stoves, sofas, air conditioners and other large items. These items are not collected by the sanitation workers, and as such, residents are asking whose responsibility it is for their disposal. The San Pedro Town Council is suggesting that before these items are placed outside the property for disposal, that homeowners should contact the council to try and coordinate if it can be collected. In the event that council cannot collect these large items at the given time, the council advises homeowners to contact the private freight services. The San Pedro Town Council hereby announces it’s new and updated Garbage pick up schedule starting as of Today, Monday, January 26th. We appreciate the patience of the general public, we do ask everyone to please separate you household garbage from the yard debris. It is of utmost importance that you bag your garbage hence making it easier and safer for the workers to handle and it is a more effective way to get your garbage picked up in a timely manner.